I've been meaning to write about this for a while now, but I haven't had a chance to. I found out a couple of months ago that the Kensal Rise library in London might be shutting down (a lot of public libraries in the U.K. seem to be shutting down) and it filled me with outrage. In fact, the idea of any library closing fills me with horror. Even though my blog focuses on African literature I've always found libraries to be really important so the second I heard about it I told myself I would write a post on it. Sadly, it's taken me a while to write on it. Growing up there weren't that many libraries for me to use. I'm not saying Lagos did not (and does not) have public libraries but they weren't necessarily all that good - mainly educational texts, not that many children or young adult books, not the best building and site maintenance, and power outages to name a few. Things may have changed, I don't know as I haven't been to a library in Lagos in a very long time (if they have I would love to know). It might seem strange why I am choosing to write a post on library closures in London - well, London is as much my home as Lagos is and UK government spending cuts are affecting public libraries. Kensal Rise library is one of them. This is a community library, and if nothing else a treasured historical building in the neighbourhood. I have been following the stories surrounding the Kensal Rise library and other local libraries in London for a while now because local libraries are a great resource for young and old alike, as well as students. I recently read an article Zadie Smith wrote about the closure of libraries in the UK and I honestly could not have said it any better than she did. The library is "an indoor public space in which you do not have to buy anything in order to stay". 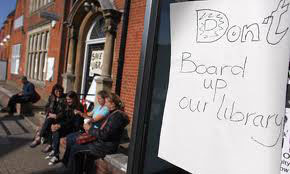 In my country, the government is trying to revamp the decaying public libraries and in the UK, the government is trying to shut them down as they obviously do not see libraries as an important necessity. It really cannot be that serious that they are shutting down libraries and I dread to think of a world where there are no libraries. Fair enough I grew up in that world, but having experienced a world where libraries (used to be) readily available, I know that they are an important, essential, and a necessary part of the public space. 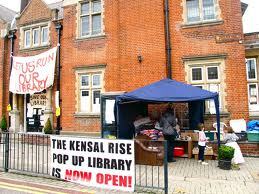 But it's not all doom and gloom, as in response to the closures, the community have set-up a pop-up library (pretty cool) and a campaign to Save Kensal Rise Library. Thanks for this. Here in Ghana we are going through a lot of similar issues. The public libraries are in pretty bad shape, though they are trying to change. You're very welcome. 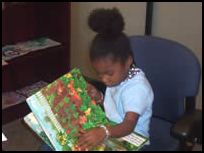 It is really sad the state of public libraries and it seems it's happening all over the world. It's nice to know, like Nigeria, Ghana is trying to change. Small steps.